Unexpectedly engrossing. Heed the mockers and youll miss one of the PCs finest and freshest driving games. Citizens of Dunwall, please accept my apologies. I was a hop, skip and a slide away from the Lord Regent's chamber when this seriously compelling lorry sim sped into my life. Suddenly, stealthy vengeance seems far less important than ensuring a load of new JCBs gets to Bratislava on time. Euro Truck Simulator 2 is that rare thing, a strong sim tethered to a strong game. Where other vehicle-obsessed devs seem to take player motivation for granted, Czech studio SCS understand that a pleasingly modelled steed needs a pleasingly modelled environment to shine. On this occasion that environment is a swathe of Europe stretching from Plymouth in the west to Wroclaw in the east, from Aberdeen in the north to Milan in the South. The tangle of motorways and major roads is stylised and condensed, but feels massive. After a splendid week of non-stop trucking the stats screen tells me I've still only seen 50% of it. There's satisfaction in exploring new routes, seeing new golden been-there-done-that squiggles appearing on the in-game map, but it tends to be the promise of cold, hard cash that gets you out of bed in the morning. 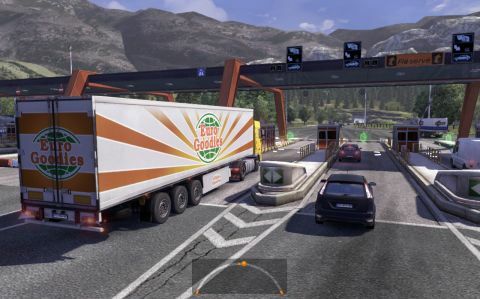 Like Farming Simulator, ETS2 has a simple yet resonant economic sandbox at its centre. You start as a low-skilled, truckless lorry jockey, forced to take work from established haulage companies. Slowly (or rapidly if you go to a bank) you amass the funds to buy your first rig and rent your first yard. Then the fun really begins. Contract perusing, truck pimping, skill upgrading, driver hiring... this is Eddie Stobart: The Game in all but name. Spending 90 minutes ferrying a tank of propane from Sheffield to Prague could (should?) be tedious. The fact that it isn't is largely down to good-if-not-quite-OMSI-standard physics, and varied road layouts and scenery. Periods of smooth, almost soporific motorway motoring nestle between passages of edgier wheelwork. One minute you're cruising along contemplating the sunset over the central reservation, the next you're on a rain-lashed country road at night, waiting for the right moment to pass a painfully slow pantechnicon. Tiredness can't kill in ETS2, but it can leave you jack-knifed in a ditch, feeling awful with a substantial repair bill to pay. The only time when the game itself loses concentration is when attempting to evoke certain regions and sounds. The further you get from central Europe the less convincing the landscapes become. No one seems to have told SCS's countryside crafters that rural Britain features long green things called hedges. Cities are often depicted with the shortest of visual shorthand – a few warehouses, the odd landmark if you're lucky. Don't expect to see a favourite local roundabout, slip-road, or speed camera in this highly-recommended HGV-driver RPG.